Step 1: Paint both halves of your egg box with two light coats of acrylic craft paint. Let dry. 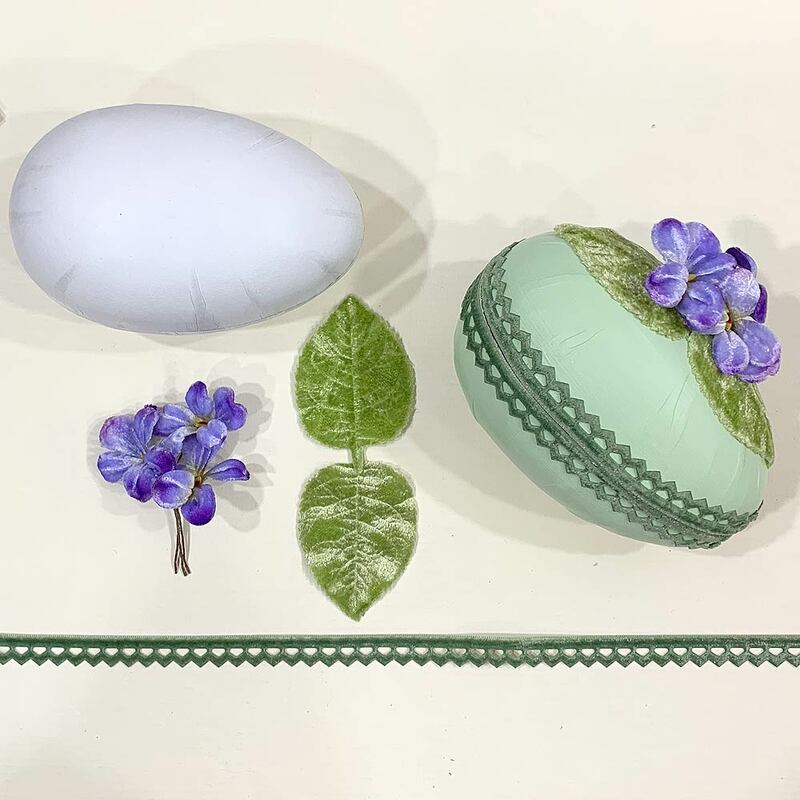 We chose light pistacchio green paint to give our eggs a botanical Victorian look. 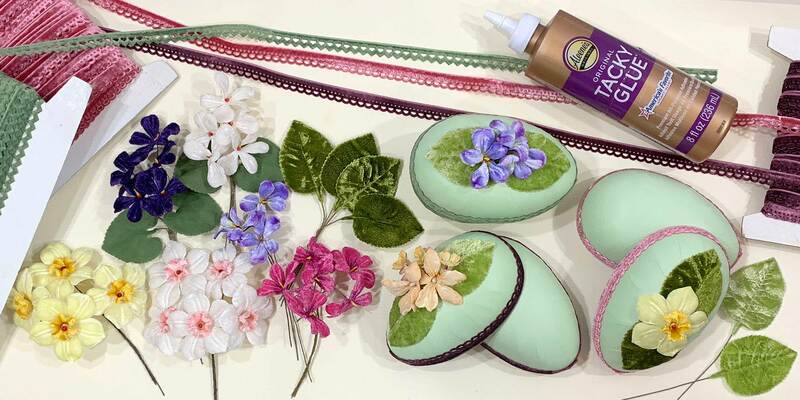 Step 2: Pair up your velvet ribbons with leaves and flowers and practice ideal positioning. It's helpful to have an idea of how your egg will look finished. 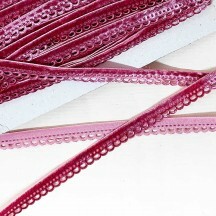 Step 3: Glue a length of velvet ribbon along the edges of each egg half. Let dry. We started and ended ours at the bottom (narrow end) of the egg. Let dry. Step 4: Glue leaves and flowers to the top of the egg. We decided on placement first, then glued down one leaf followed by the second leaf with flower wires gently tucked under. Let dry. 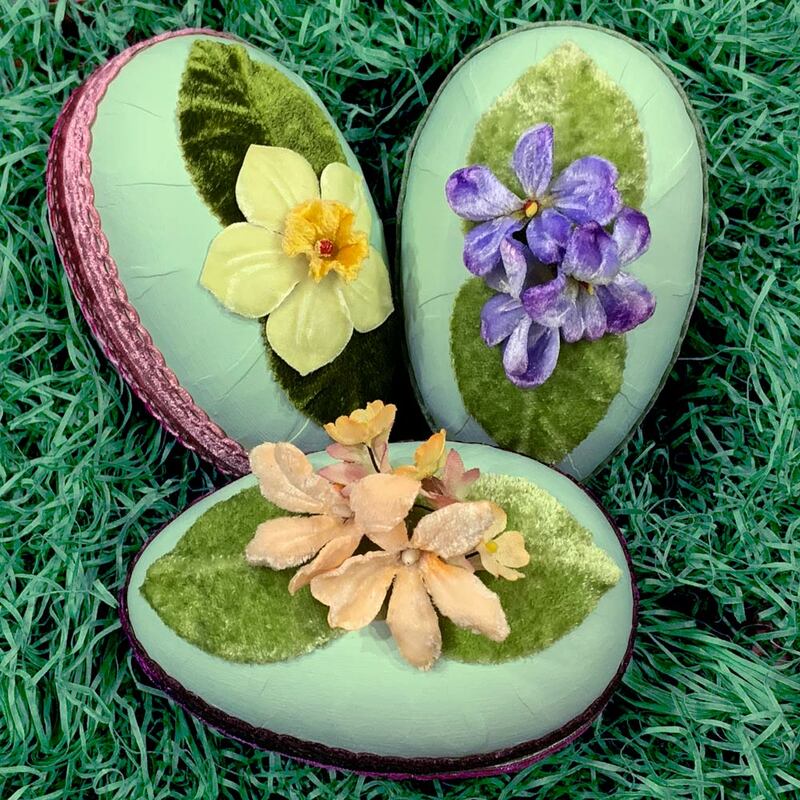 Tips: You can leave part of the wire stem attached to each leaf -- be sure to bend it gently to match the curve of the egg before glueing -- or gently remove it completely. 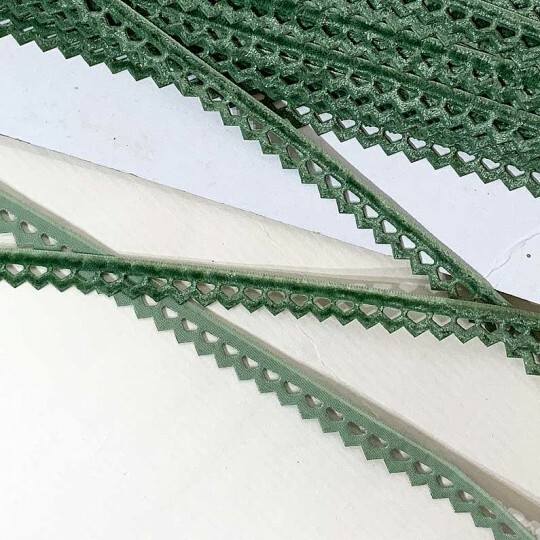 We cut our flower stems leaving 1-2" of length in order to be able to tuck the stems under one of the leaves when glueing. Once dry, you can manipulate your flowers slightly. 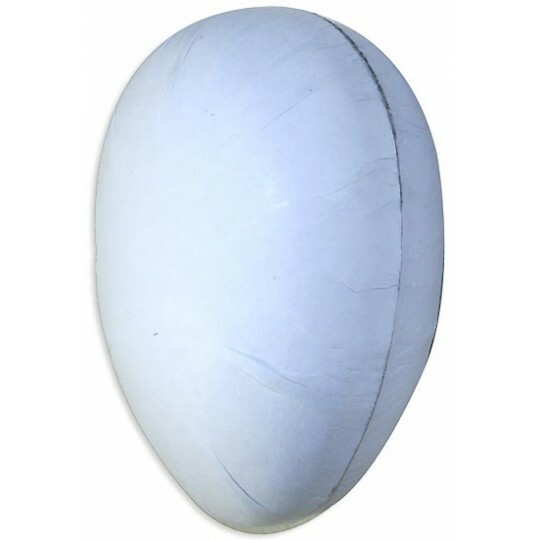 If your egg box seems to fit together unevenly after painting, position it as you wish and wrap a few rubber bands around it to help it hold position and regain a tighter fit. We put our flowers and leaves on the top of the egg -- the half with no liner along the inside edge. Don't limit yourself just to velvet: this project would look exquisite with a wide range of flower and leaf combos. 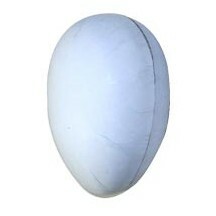 Unfinished white papier mache egg container in matte white for you to embellish. Inside of egg is plain. Made in Germany. Measures 4 1/2" long, 3" across and 3" high. This container is perfect for decorating with scraps and dresden trims. 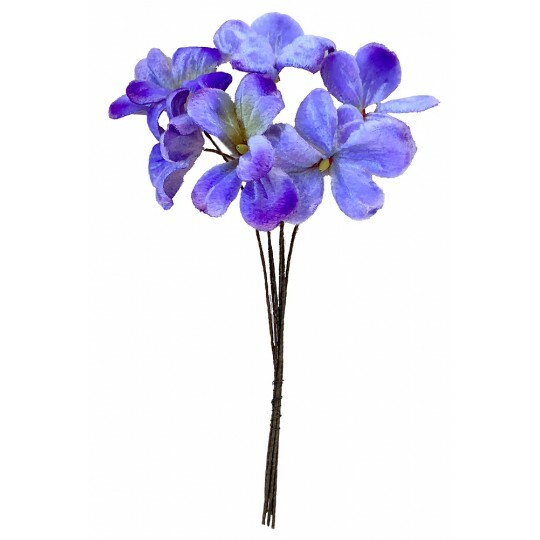 Bouquet of 6 beautiful velvet forget me nots in royal purple. Velvet blossoms are approx. 1" across. Bouquet is approx. 5-1/2" long overall. 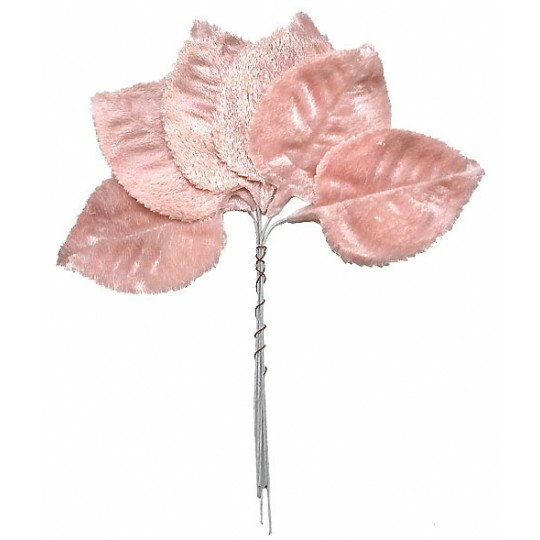 Each petal and stamen has been handmade and hand assembeld with meticulous attention to detail. Made for us in the Czech Republic. 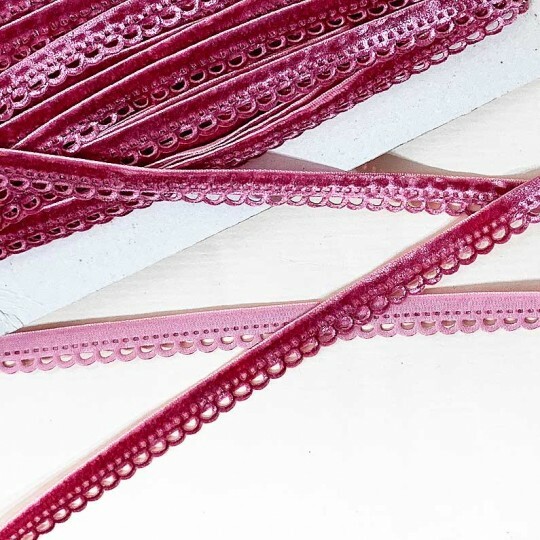 This plush and soft velvet ribbon trim in antique rose pink measures 7/16" wide (11 mm) and has a pretty pierced scallop and dot design. 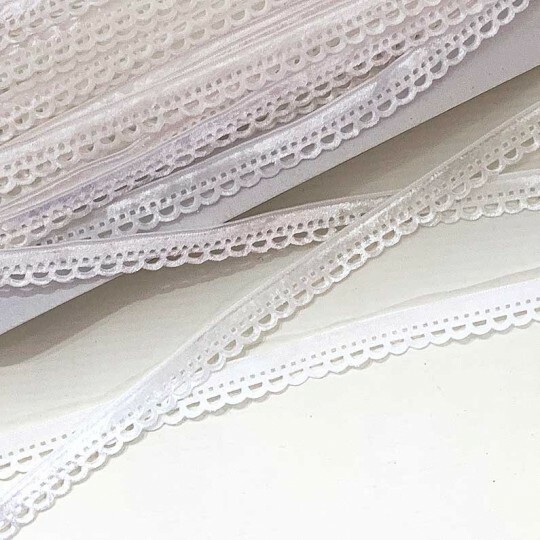 Makes a lovely accent for gift wrapping, craft and sewing projects. Priced per yard, please enter the number of yards desired below. This plush and soft velvet ribbon trim in deep violet purple measures 7/16" wide (11 mm) and has a pretty pierced scallop and dot design. Makes a lovely accent for gift wrapping, craft and sewing projects. Priced per yard, please enter the number of yards desired below. 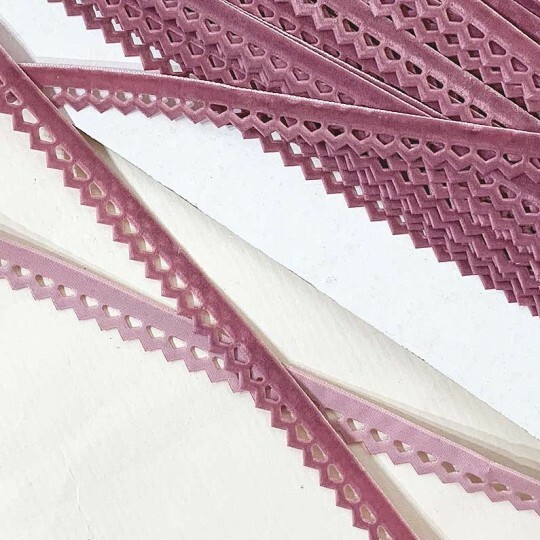 This plush and soft velvet ribbon trim in dusty rose pink measures 7/16" wide (11 mm) and has a pretty pennant point design. Makes a lovely accent for gift wrapping, craft and sewing projects. Priced per yard, please enter the number of yards desired below. 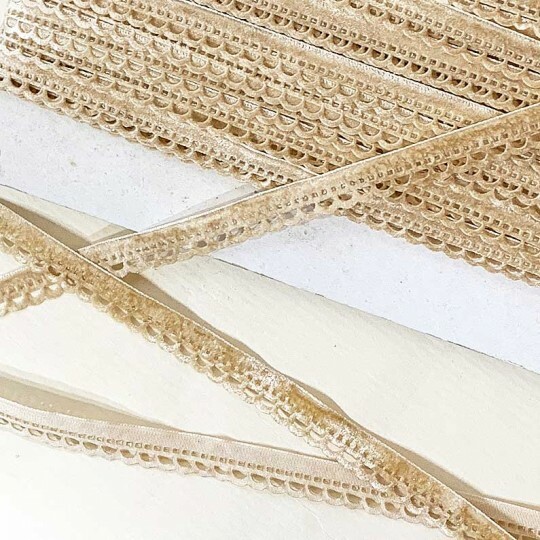 This plush and soft velvet ribbon trim in light tan measures 7/16" wide (11 mm) and has a pretty pierced scallop and dot design. Makes a lovely accent for gift wrapping, craft and sewing projects. Priced per yard, please enter the number of yards desired below. This plush and soft velvet ribbon trim in soft green measures 7/16" wide (11 mm) and has a pretty pennant point design. Makes a lovely accent for gift wrapping, craft and sewing projects. Priced per yard, please enter the number of yards desired below. 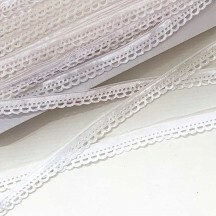 This plush and soft velvet ribbon trim in white measures 7/16" wide (11 mm) and has a pretty pierced scallop and dot design. Makes a lovely accent for gift wrapping, craft and sewing projects. Priced per yard, please enter the number of yards desired below. 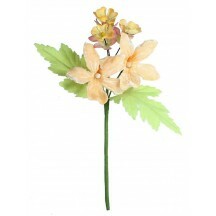 Spray of 2 beautiful velvet flowers in pale apricot with 3 petite fabric flowers and 2 pale green leaves. Velvet blossoms are approx. 1-3/4" across. Spray is approx. 5-1/2" long overall. Each petal, leaf and stamen has been handmade and hand assembeld with meticulous attention to detail. Made for us in the Czech Republic. 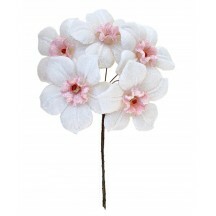 Spray of 2 beautiful velvet flowers in pale pink with 3 petite fabric flowers and 2 pale green leaves. Velvet blossoms are approx. 1-3/4" across. Spray is approx. 5-1/2" long overall. Each petal, leaf and stamen has been handmade and hand assembeld with meticulous attention to detail. Made for us in the Czech Republic. Spray of 2 beautiful velvet flowers in purple with 3 petite fabric flowers and 2 pale green leaves. Velvet blossoms are approx. 1-3/4" across. Spray is approx. 5-1/2" long overall. 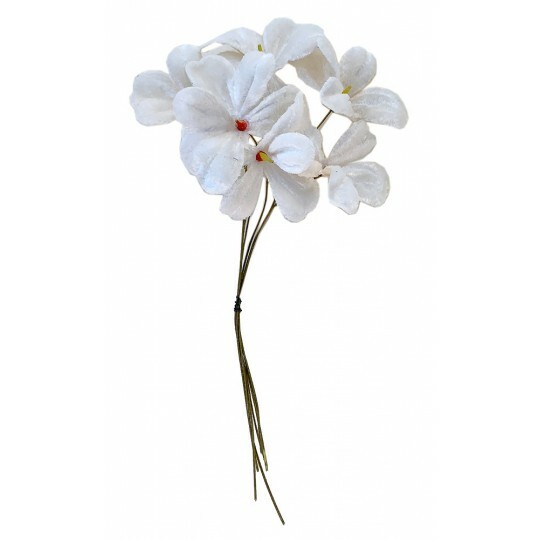 Each petal, leaf and stamen has been handmade and hand assembeld with meticulous attention to detail. Made for us in the Czech Republic. 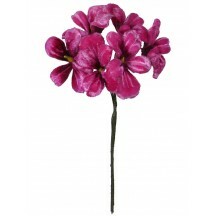 Spray of 5 beautiful velvet violets in burgundy ombre with 2 green fabric leaves. Velvet blossoms are approx. 1-1/2" across; leaves measure 1-3/4" long by 1-1/2" across. Bouquet is approx. 6" long overall. 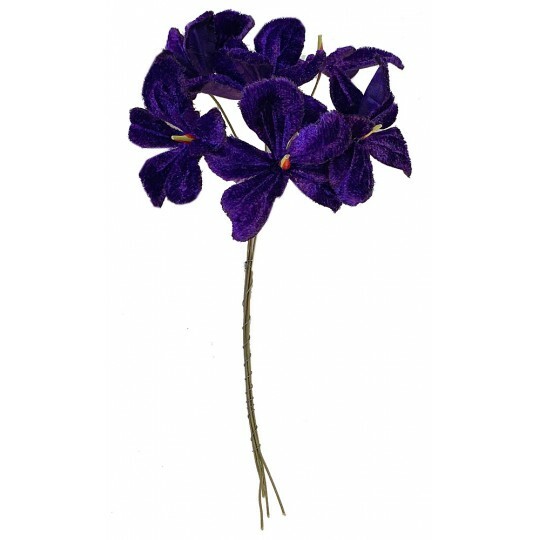 Each petal, leaf and stamen has been handmade and hand assembled with meticulous attention to detail. Made for us in the Czech Republic. 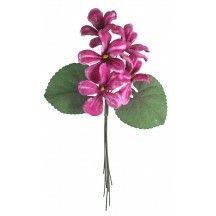 Spray of 5 beautiful velvet violets in deep pink ombre with 2 green fabric leaves. Velvet blossoms are approx. 1-1/2" across; leaves measure 1-3/4" long by 1-1/2" across. Bouquet is approx. 6" long overall. Each petal, leaf and stamen has been handmade and hand assembled with meticulous attention to detail. Made for us in the Czech Republic. 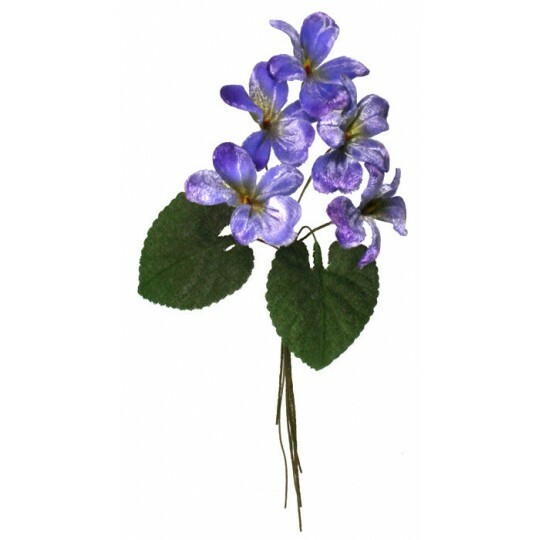 Spray of 5 beautiful velvet violets in light blue ombre with 2 green fabric leaves. Velvet blossoms are approx. 1-1/2" across; leaves measure 1-3/4" long by 1-1/2" across. Bouquet is approx. 6" long overall. 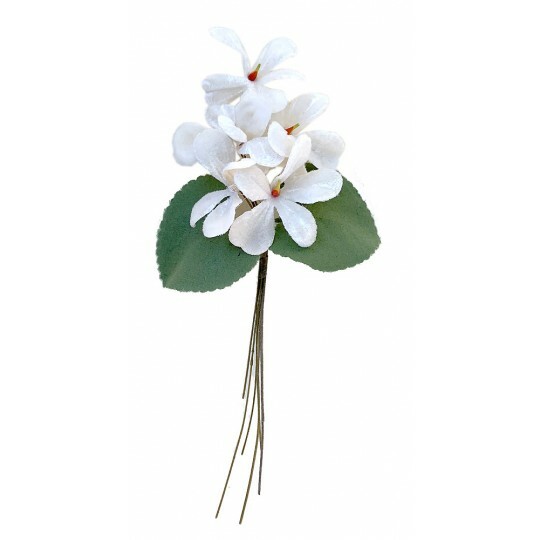 Each petal, leaf and stamen has been handmade and hand assembled with meticulous attention to detail. Made for us in the Czech Republic. 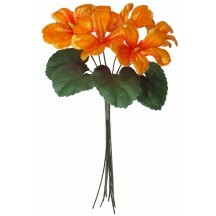 Spray of 5 beautiful velvet violets in orange ombre with 2 green fabric leaves. Velvet blossoms are approx. 1-1/2" across; leaves measure 1-3/4" long by 1-1/2" across. Bouquet is approx. 6" long overall. 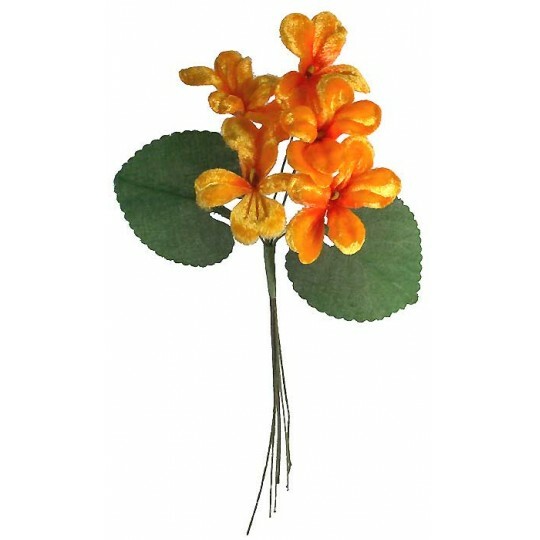 Each petal, leaf and stamen has been handmade and hand assembled with meticulous attention to detail. Made for us in the Czech Republic. Spray of 5 beautiful velvet violets in violet purple with 2 green fabric leaves. Velvet blossoms are approx. 1-1/2" across; leaves measure 1-3/4" long by 1-1/2" across. Bouquet is approx. 6" long overall. 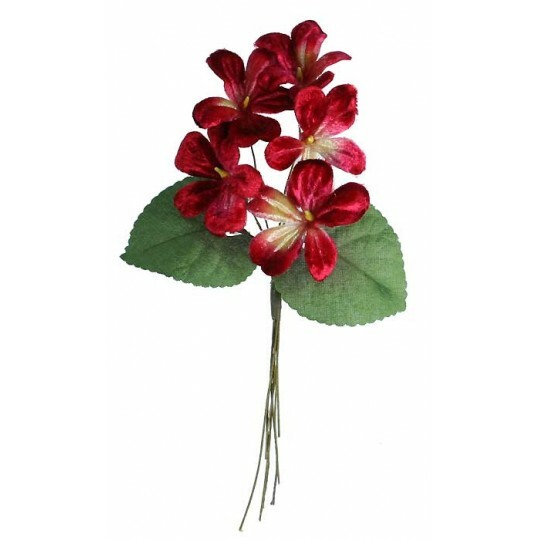 Each petal, leaf and stamen has been handmade and hand assembled with meticulous attention to detail. Made for us in the Czech Republic. 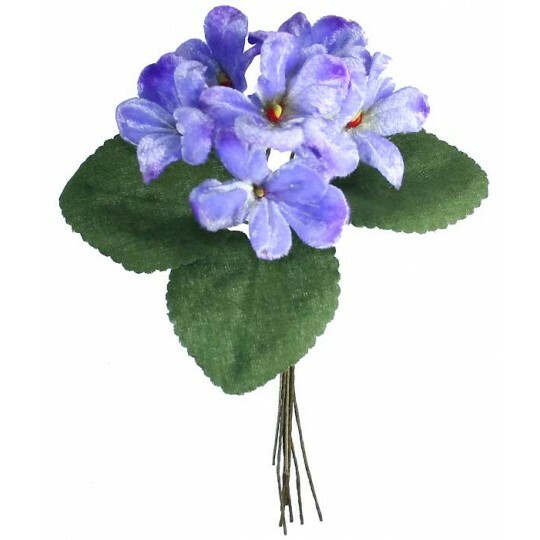 Spray of 5 beautiful velvet violets in white with 2 green fabric leaves. Velvet blossoms are approx. 1-1/2" across; leaves measure 1-3/4" long by 1-1/2" across. Bouquet is approx. 6" long overall. 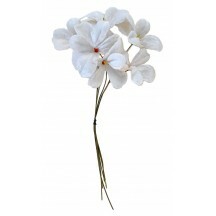 Each petal, leaf and stamen has been handmade and hand assembled with meticulous attention to detail. Made for us in the Czech Republic. Bouquet of 6 beautiful velvet violets in orange ombre with 4 green fabric leaves. Velvet blossoms are approx. 1-1/2" across; leaves measure 1-1/4" long by 1-1/8" across. Bouquet is approx. 5" long overall. 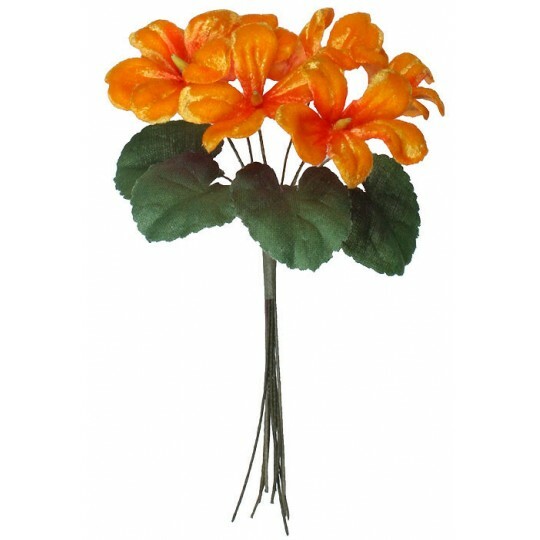 Each petal, leaf and stamen has been handmade and hand assembled with meticulous attention to detail. Made for us in the Czech Republic. Bouquet of 6 beautiful velvet violets in pale blue ombre with 3 green fabric leaves. Velvet blossoms are approx. 1-1/2" across; leaves measure 1-3/4" long by 1-1/2" across. Bouquet is approx. 5" long overall. 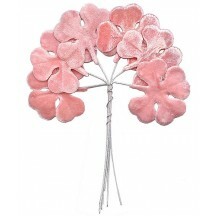 Each petal, leaf and stamen has been handmade and hand assembled with meticulous attention to detail. Made for us in the Czech Republic. 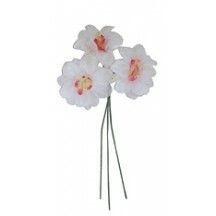 Spray of 3 beautiful velvet orchids in white and purple. Velvet blossoms are approx. 2" across. Bouquet is approx. 6-1/2" long overall. Each petal and stamen has been handmade and hand assembeld with meticulous attention to detail. Made for us in the Czech Republic. 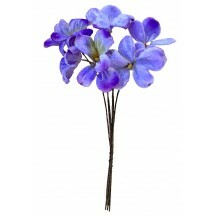 Bundle of 6 beautiful velvet violets in blue ombre. Velvet blossoms are approx. 1-1/2" across. Bouquet is approx. 5" long overall. Each petal and stamen has been handmade and hand assembled with meticulous attention to detail. Made for us in the Czech Republic. Bundle of 6 beautiful velvet violets in deep pink ombre. Velvet blossoms are approx. 1-1/2" across. Bouquet is approx. 5" long overall. 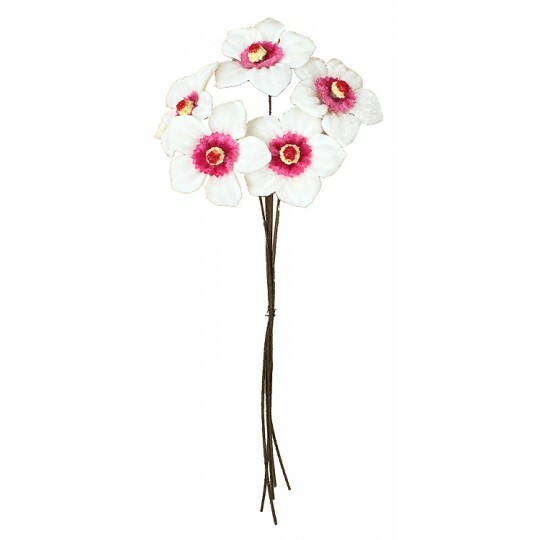 Each petal and stamen has been handmade and hand assembled with meticulous attention to detail. Made for us in the Czech Republic. 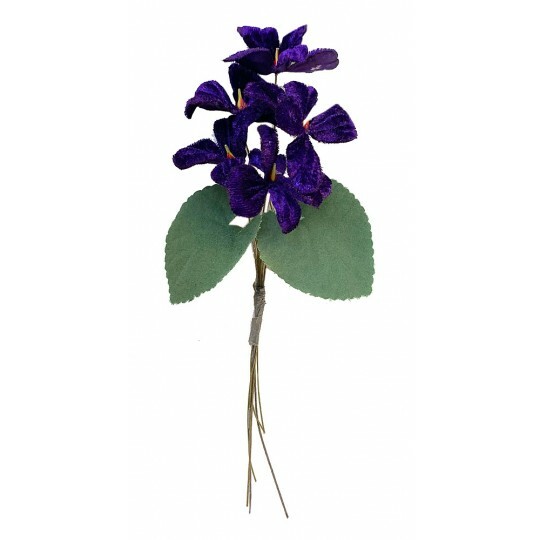 Bundle of 6 beautiful velvet violets in deep violet purple. Velvet blossoms are approx. 1-1/2" across. Bouquet is approx. 5" long overall. Each petal and stamen has been handmade and hand assembled with meticulous attention to detail. Made for us in the Czech Republic. Bundle of 6 beautiful velvet violets in white. Velvet blossoms are approx. 1-1/2" across. Bouquet is approx. 5" long overall. Each petal and stamen has been handmade and hand assembled with meticulous attention to detail. Made for us in the Czech Republic. Bunch of 5 beautiful velvet narcissus in light yellow with yellow centers. Fabric blossoms are approx. 2" across with 4-1/2" wire stems. 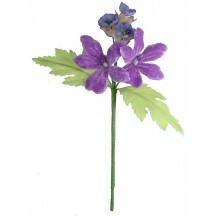 Each petal and stamen has been handmade and hand assembled with meticulous attention to detail. Made for us in the Czech Republic. Bunch of 5 beautiful velvet narcissus in white with light pink centers. Fabric blossoms are approx. 2" across with 4-1/2" wire stems. 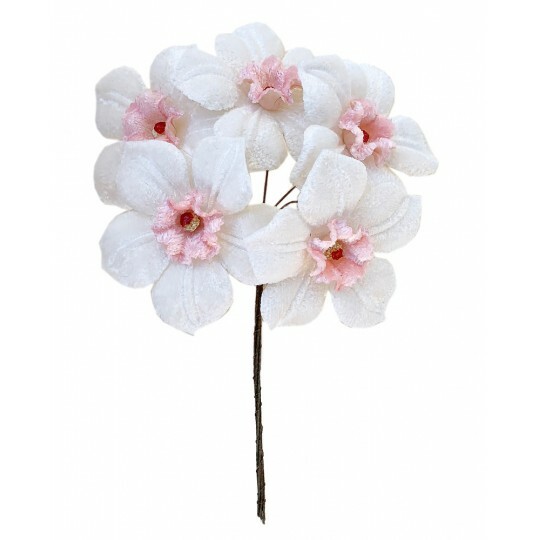 Each petal and stamen has been handmade and hand assembled with meticulous attention to detail. Made for us in the Czech Republic. 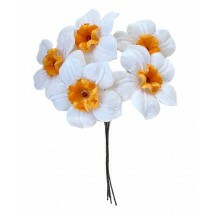 Bunch of 5 beautiful velvet narcissus in white with orange centers. Fabric blossoms are approx. 2" across with 4-1/2" wire stems. 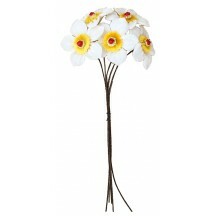 Each petal and stamen has been handmade and hand assembled with meticulous attention to detail. Made for us in the Czech Republic. Bunch of 5 beautiful velvet narcissus in white with yellow centers. Fabric blossoms are approx. 2" across with 4-1/2" wire stems. 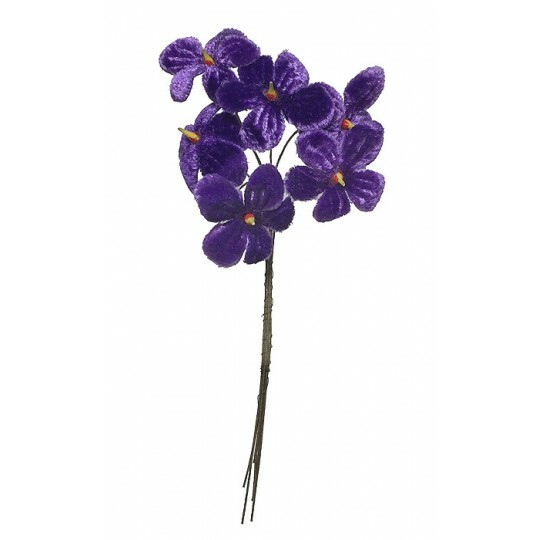 Each petal and stamen has been handmade and hand assembled with meticulous attention to detail. Made for us in the Czech Republic. Set of 6 Embossed Moss Green Velvet Rose Leaves ~ Czech Repub. Set of 6 embossed velvet rose leaves in pale moss green. Each leaf measures 2 1/2 long by 1 5/8" wide on a 3" brown paper wrapped wire stem. Handmade in the Czech Republic. Set of 6 Embossed Peacock Blue Velvet Rose Leaves ~ Czech Repub. 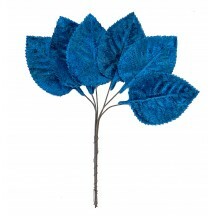 Set of 6 embossed velvet rose leaves in peacock blue. Each leaf measures 2 1/2 long by 1 5/8" wide on a 3" brown paper wrapped wire stem. Handmade in the Czech Republic. Set of 6 Embossed Pink Velvet Rose Leaves ~ Czech Repub. 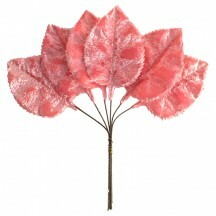 Set of 6 embossed velvet rose leaves in pink. Each leaf measures 2 1/2 long by 1 5/8" wide on a 3" white paper wrapped wire stem. Handmade in the Czech Republic. Set of 6 Embossed Purple Velvet Rose Leaves ~ Czech Repub. 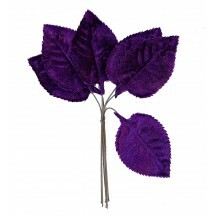 Set of 6 embossed velvet rose leaves in purple. Each leaf measures 2 1/2 long by 1 5/8" wide on a 3" white paper wrapped wire stem. Handmade in the Czech Republic. Set of 6 Green Velvet Leaves ~ Czech Repub. 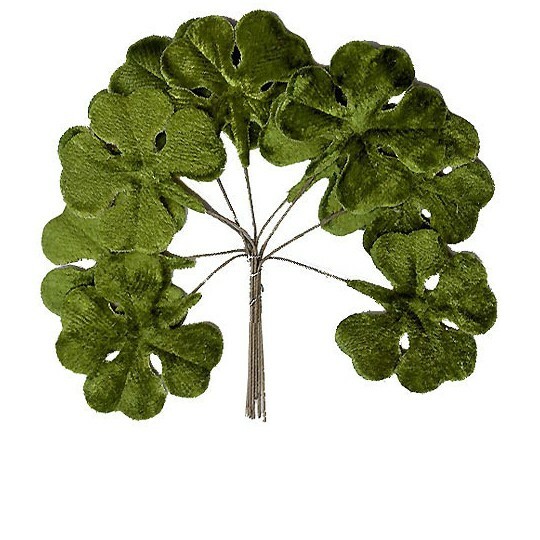 Set of 6 embossed velvet leaves in green. 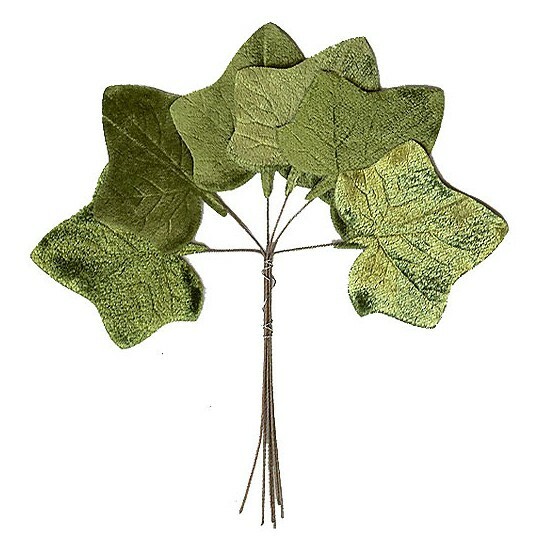 Each leaf measures 2-1/2" long by 1-5/8" wide with 3-1/2" brown paper wrapped wire stem. Handmade in the Czech Republic exclusively for us. 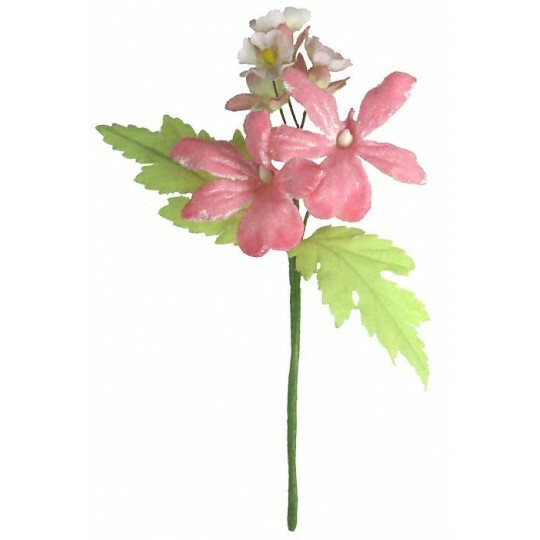 Set of 6 Pale Pink Velvet Leaves ~ Czech Repub. Set of 6 embossed velvet leaves in pale pink. Each leaf measures 2-1/2" long by 1-5/8" wide with 3-1/2" white paper wrapped wire stem. Handmade in the Czech Republic exclusively for us. 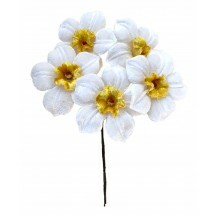 Bunch of 5 beautiful velvet narcissus in white with pink centers. Fabric blossoms are approx. 1-1/8" across with 4-1/2" wire stems. 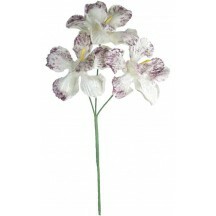 Each petal and stamen has been handmade and hand assembled with meticulous attention to detail. Made for us in the Czech Republic. 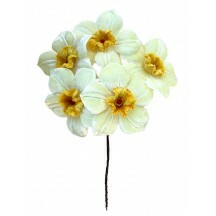 Bunch of 5 beautiful velvet narcissus in white with yellow centers. Fabric blossoms are approx. 1-1/8" across with 4-1/2" wire stems. Each petal and stamen has been handmade and hand assembled with meticulous attention to detail. Made for us in the Czech Republic. Set of 6 Green Velvet Ivy Leaves ~ Czech Repub. 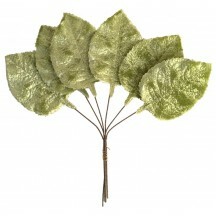 Set of 6 embossed velvet leaves in green. Each leaf measures 2" long by 2" wide with 3-1/2" brown paper wrapped wire stems. Handmade in the Czech Republic. Set of 10 Green Velvet Shamrocks ~ Clover Leaves ~ Czech Repub. Set of 10 embossed velvet shamrocks in green. Each leaf measures 1-7/8" long by 1-7/8" wide with 2" green paper wrapped wire stem. Handmade in the Czech Republic exclusively for us. 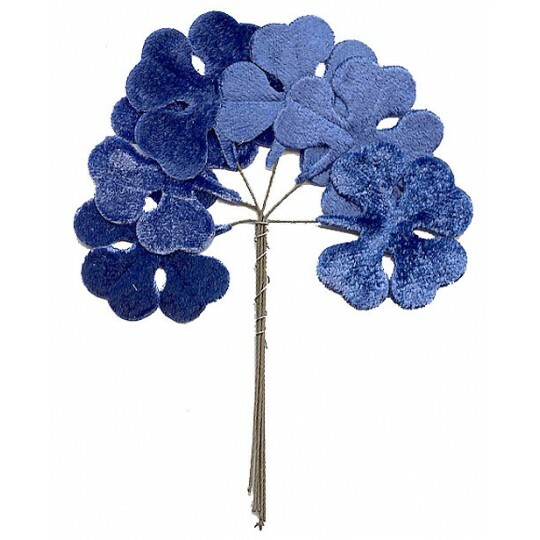 Set of 6 Blue Velvet Shamrocks ~ Clover Leaves ~ Czech Repub. Set of 6 embossed velvet shamrocks in cerulean blue. 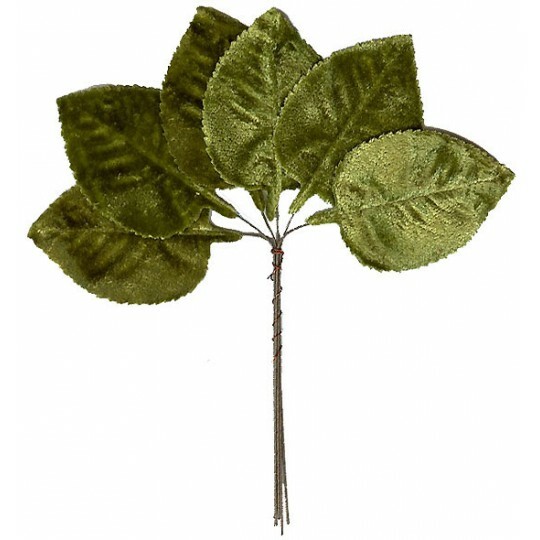 Each leaf measures 1-7/8" long by 1-7/8" wide with 3-1/2" white paper wrapped wire stem. Handmade in the Czech Republic exclusively for us. Set of 6 Peach Velvet Shamrocks ~ Clover Leaves ~ Czech Repub. 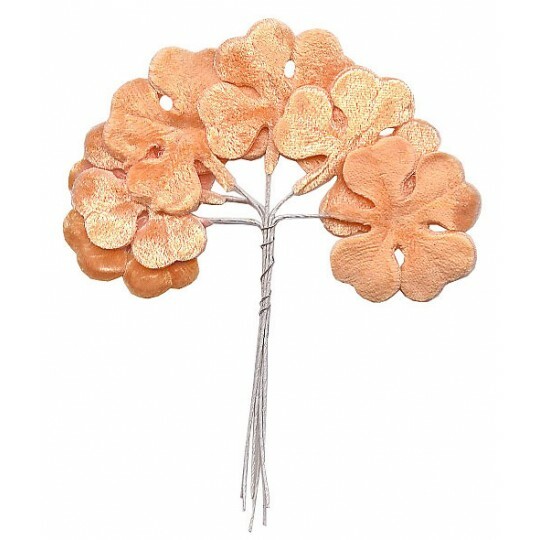 Set of 6 embossed velvet shamrocks in peach. 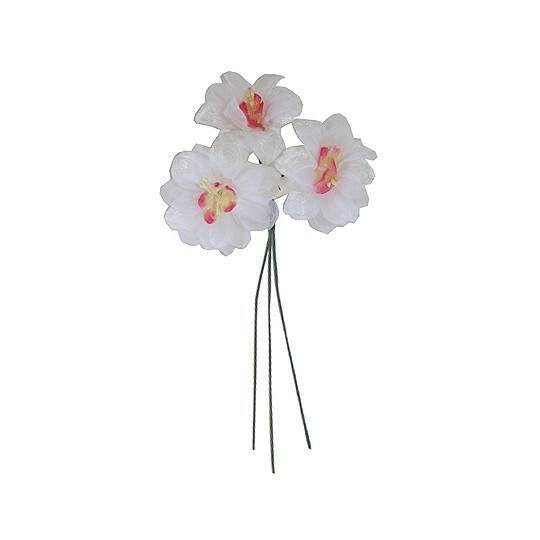 Each leaf measures 1-7/8" long by 1-7/8" wide with 3-1/2" white paper wrapped wire stem. Handmade in the Czech Republic exclusively for us. 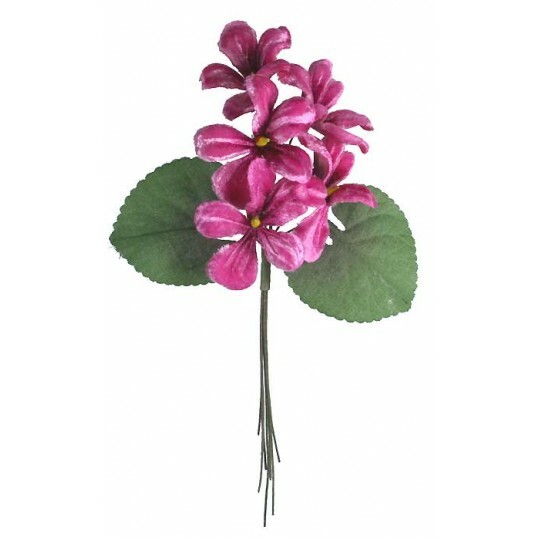 Set of 6 Pink Velvet Shamrocks ~ Clover Leaves ~ Czech Repub. Set of 6 embossed velvet shamrocks in light pink. Each leaf measures 1-7/8" long by 1-7/8" wide with 3-1/2" white paper wrapped wire stem. Handmade in the Czech Republic exclusively for us. 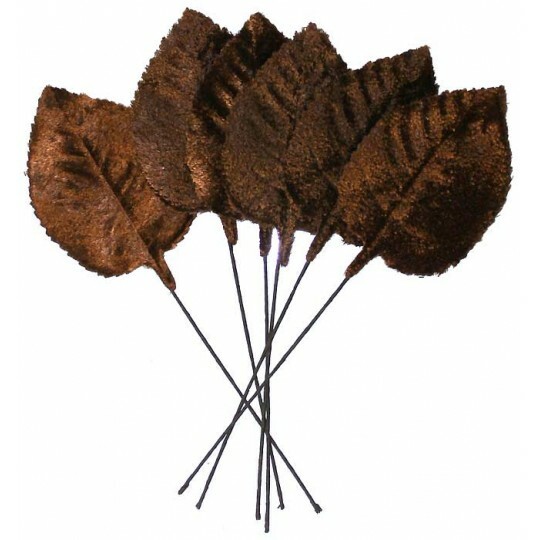 Set of 6 Embossed Brown Velvet Rose Leaves ~ Czech Repub. Set of 6 embossed velvet rose leaves in brown. Each leaf measures 2 1/2 long by 1 5/8" wide on a 3" black paper wrapped wire stem. Handmade in the Czech Republic. Set of 6 Embossed Lavender Purple Velvet Rose Leaves ~ Czech Repub. 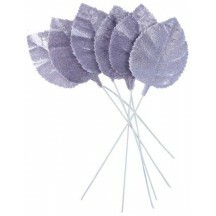 Set of 6 embossed velvet rose leaves in lavender purple. Each leaf measures 2 1/2 long by 1 5/8" wide on a 3" white paper wrapped wire stem. Handmade in the Czech Republic. 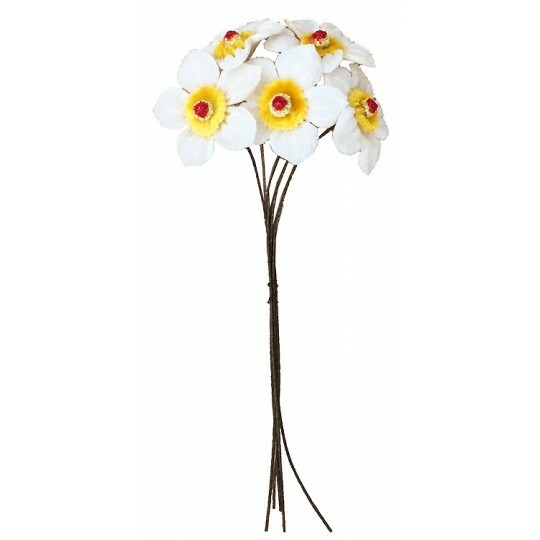 Sprig of vintage embossed velvet and organdy daffodil flowers in white with pink and yellow centers. 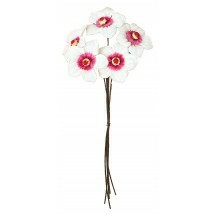 There are 3 blossoms measuring 1 7/8" across on wired stems. Overall length of the sprig is 5 1/2". Original paper tag says "Made in Japan".